Jesus loves me...or does He? Yesterday I purchased a 10-count package of Southwest Tortillas from my local food market and, behold, I was blessed with an image of The Savior on a tortilla !!!!! Then, I got to thinking, "Why didn't Jesus just say something to me or better yet, just have a new Dodge Ram pickup truck appear in my driveway ?" 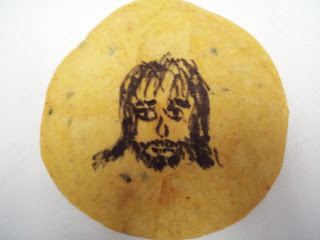 All those Masses I attended and Rosaries I said and all I got for my efforts is a damned tortilla.